Bailey Beats the Blah has Arrived! SQUEE! Bailey Beats the BLAH has finally arrived from USA after weeks of waiting … and waiting. 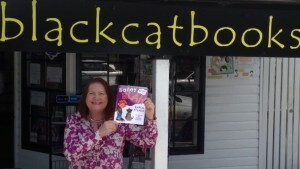 In just ten days, I’ll launch Bailey Beats the Blah, picture book to builds kid’s self-esteem and resilience skills at BlackCat Books Paddington. a teacher’s journey back from harassment and Insanity. I rushed inside, tore open the boxes, holding my breath with anticipation. I snatched up a copy, sniffing the ink. Every emblazoned word shouted out to me. Aaron Pocock’s vibrant illustrations popped right off the page. Perfect. Just like I had imagined. But more striking. What’s Bailey Beats the Blah about? Bailey hates his new school. He has no friends. His dog Fuzzy slobbers all over him. BLAH! How can Bailey change his BLAH to HA-HA-HA! 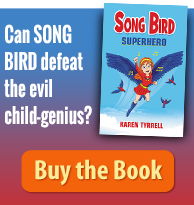 Bailey empowers kids to overcome worry thoughts and sad days, building self-esteem and self-reliance. 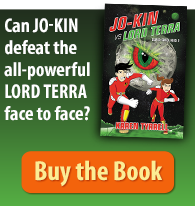 Supported by Kids Help Line & aligned with Kids Matter school program. 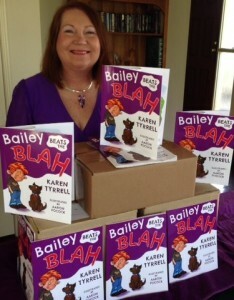 Today I ferried over copies of Bailey Beats the Blah, plus my brand-new bookmarks and my eye-catching purple banner. 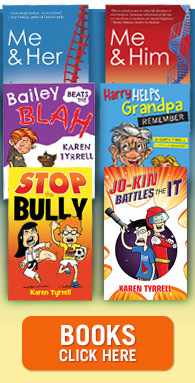 I will send you a signed copy of Bailey Beats the Blah for only $16.95 including postage. PLUS : a goody bag with a Bailey bookmark, Bailey postcard, special fridge magnet, stickers and wallet card courtesy of Kids Help Line. Can’t wait to share Bailey Beats the Blah with all my friends and their kids. Please tell every parent, teacher and kid you know that BAILEY has arrived! CLICK the Face book LIKE, Tweet and Google plus buttons… Please your order below. 7 comments to Bailey Beats the Blah has Arrived! 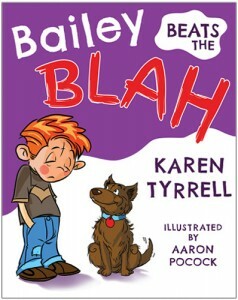 I would absolutely LOVE a signed copy of Bailey Beats the BLAH! Please let me know how I can order a copy. Bailey will help your grandson especially if you follow up with discussion via Teachers notes and downloadable activities coming next week. I’ll email you soon with my banking details and ask you to send your address. I’m excited for you .. would love a copy of Bailey beats the BLAH !!! !